Editor’s Note: This is the first of a two part article entitled "Ittosai’s Test" which is an excerpt from Dave Lowry’s new book, “Clouds In The West.” It is about the eccentric but brilliant swordsman Ito Ittosai Kagehisa, the founder of the sword tradition of Itto ryu, and his efforts to find a successor. Itto ryu eventually grew to be one of the largest and most important schools of Japanese swordmanship. It was adopted by the military authority of Japan, the Tokugawa shogun, and other lords of feudal Japan, including the Aizu from which diato ryu aikjujutsu sprang through the legendary teacher Takeda Sokaku Sensei. Itto ryu also influenced the technical curriculum of kendo (the modern Japanese art of fencing that uses mock weapons made of bamboo). Today there are several separate traditions of Itto ryu practiced. Another important variant is Onoha Itto Ryu Sokaku Den, passed down through several daito ryu and aiki budo traditions. As he approaches the end of his productive teaching career, every master of every art must come to grips with a difficult problem. He is faced with the task of selecting a worthy successor or successors to carry on his teachings. Often, this will be the culmination of his experience in the art. The true master, whether his Way is that of the tea ceremony, or flower arranging, or Noh drama, will know that evidence of his skills is at best, ephemeral. Even masters of calligraphy or pottery will leave behind only so much concrete evidence of their work, and those scrolls or bowls will eventually disintegrate or break. All that can truly exist with any hope of permanence is the legacy the master leaves behind in the generation of his students. This is particularly true in the case of the martial Ways, and it must have been an even more critical concern during Japan’s feudal age when the art of swordsmanship was literally a matter of life and death. 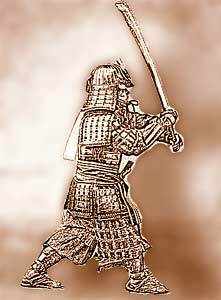 Using a sword was a combative necessity for the professional warrior class, the samurai. In many instances the reputations of those ryu devoted to its practice rested almost entirely on the character of the school’s headmaster. In those cases where the headmaster was infirm or crippled or otherwise clearly not a representative of the ryu in a technical sense, maintaining the status of the ryu would be the responsibility of the senior practitioners. So in either case, the concern for passing along the secrets and lore and techniques of a ryu in their entirety was not to be undertaken lightly. If a ryu had a large number of exceptional students, the master could take his time, carefully shepherding progress and evaluating the potential of a crop of aspirants. Of course, in many martial ryu, headmastery was automatically conferred upon the eldest son of the school’s master. This conveniently narrowed the choice for the ryu’s successor. And if, as it sometimes happened, the son was not terribly impressive or skilled in his father’s art, the father would make certain to have a gathering of the school’s best exponents around his offspring. They served in one way or another as unofficial leaders and instructors, thus maintaining the school’s reputation. But as the last drifts of the wet, gray snow of the winter melted away in the sixteenth year of Tensho (1588), the swordsman Ito Ittosai Kagehisa could depend neither on a large and healthy crop of prospective successors among his students nor on a family heir ready to take over his Itto ryu. He had only two disciples from whom he could choose to carry on the traditions and strategies of his system of combat with the sword. One was Migogami Ono Tenzen, a young samurai attached to the Satomi clan, known for his fiery temper. The other was Zenki, a ferryman who, while rowing him across a river, had challenged Ittosai. Kagehisa easily defeated Zenki once they reached the opposite shore, but, impressed with the ferryman’s attitude, he accepted Zenki as his first student. Kagehisa, the founder of the Itto ryu, was, to put it as gently as possible, an interesting character. To be more honest, he was an eccentric nutball. He was a brilliant swordsman, to be sure. His Itto ryu would eventually be adopted by the Tokugawa shogun as one of the two “official” schools of swordsmanship under the direct patronage of the shogunal government. Even with such successes, he was enigmatic. His behavior was often bizarre by the conservative standards of his era. So when it came time to choose a successor, no one who knew of Kagehisa’s history would have been surprised that the master chose an extreme method to make the decision. Martial historians of Japan suggest much of Kagehisa’s character was formed by the early deaths of his parents. An orphan, he was raised by a priest at the Mishima temple, in a village on the coast of the Izu Peninsula, on the southern part of the main island of Japan. From fairly early on in his life, Ittosai—then known by the childhood name of Yagoro—apparently was preoccupied with the sword. He swung a wooden stick for hours each day, fighting mock duels with companions or battling against tree branches or boulders when he was alone. At around the age of fifteen, his swordplay took a more serious turn. Thieves appeared at the Mishima temple, intent on ransacking the place for whatever they could find. Expecting to find it defended only by some of the elderly monks, they were not prepared for the young Kagehisa, who waded into the group, wildly swinging his stick with such enthusiasm that they were driven off the temple grounds in a panic. In gratitude for defending the temple, the priest gave Kagehisa a sword and enough money to start him off on a search for a competent teacher to show him how to properly use the weapon. Whether or not Kagehisa planned to do just that is anyone’s guess. For an orphan kid, off on his own, experiencing life’s temptations and opportunities outside the walls of a temple—maybe Kagehisa found other ways to spend the money or his time. Whatever he did, he eventually ended up in Kamakura. Before he found instruction in swordsmanship, if that’s what he was looking for, he went to the Tsurugaoka Hachimangu shrine there. Kagehisa’s choice of this shrine was almost certainly no accident. The central Tsurugaoka Hachimangu shrine is dedicated to Hachiman, the Buddhist deity of war. Yoritomo Minamoto built the shrine in the twelfth century, immediately after his clan defeated the Taira family, securing for Yoritomo the position of shogun. The shrine was, when Kagehisa arrived, a vast complex of smaller temples and shrines, mixing worship of both Shinto and Buddhist ritual. Today, it is most famous as the site of annual displays of yabusame, or mounted archery, where horsemen ride down lanes, shooting at targets as they go, cheered by thousands. When we read of famous warriors and swordsmen secreting themselves in temples and shrines, looking for divine inspiration in their art, we may have images of them standing alone out in a temple courtyard, swinging their weapons as ascetic priests in flowing robes glide gracefully by in the background. But places like Tsurugaoka were natural destinations for those of the samurai class. After losing their leader, or when the fortunes of war left their fiefs financially destitute, or often because they grew tired of the bloodshed and gore, many samurai became monks. While their ecclesiastical duties occupied some of their day, they did not necessarily abandon their martial arts training. In fact, maintaining combative skills at many temples and shrines would have been encouraged, since one never knew when the next insurrection or war could have posed a threat. While Kagehisa may have prayed for supernatural guidance and contemplated the Meaning of Life at Tsurugaoka, he was probably also watching or training with others who knew which end of the sword went where, to say the least. According to documents detailing the foundation of Kagehisa’s style of swordsmanship, he spent six days at the temple, and on the night of the last day, he was out alone in the yard, swinging his sword, when an attacker—similarly armed—slipped up behind him. The intent, goes the story, was robbery. (Are we callous skeptics for wondering just what kind of target an itinerant orphaned young man might have made for a robber? Possibly. On the other hand, given the poverty that afflicted so much of Japan during that era, it’s possible Kagehisa might have been a tempting mark if for no other reason than to steal his weapon. Kagehisa’s Bizen blade would have been worth more than the net income of most Japanese at that time.) As the assailant came just to within cutting distance, sword drawn and ready to strike, Kagehisa suddenly whirled around and slashed with his own weapon, killing the would-be attacker at the last possible moment. Here’s what I’ve always liked about Kagehisa. In most stories of this nature, the killing of the attacker would have meant a kind of instant enlightenment. “Having thus discovered the secrets of the sword, our founder created the blah-blah ryu,” goes the refrain in many of the ancient densho, or scrolls of transmission. Not in the case of the Itto ryu. Kagehisa whacked out an assailant—and hadn’t a clue as to how he’d done it. Rather than being lightning-struck with a sudden realization into the heart of swordsmanship, his first thought was to get out of Dodge, lest he be arrested for murder. (Which, to return to the position of the skeptic, makes us suspect Kagehisa was training with someone, things got out of hand, and the opponent was killed.) He went to Edo, the capitol city—a bustling place, and larger than London at that time. Kagehisa could find anonymity there, in case authorities were looking for him. He found a school of the sword as well. He entered the Kannemaki ryu, a school of the art taught by Kannemaki Jisai. Kannemaki was an accomplished expert in the Chujo ryu, one of the oldest schools of swordsmanship in Japan, one that is regrettably extinct today. We know very little of its techniques or strategies. Kannemaki apparently knew a lot about them; he had mastered the system and had found some room for improvement—evidently enough to compel him to found his own, new school of swordsmanship, the Kannemaki ryu. He was thriving in Edo; he’d picked a good location and a better time to teach the art of the sword. Battlefield combat had been almost entirely replaced by one-on-one dueling or other such individual fighting. It was an atmosphere that led to an explosion of different techniques and systems, and Kannemaki had a long list of those eager to train with him. Kagehisa readily fit into the school. He must have trained hard and pleased his teacher, since he spent five years under Kannemaki’s tutelage. And during that time, we can imagine, treating it as though it were some kind of Zen koan, he thought about that killing in the temple yard back at Tsurugaoka Hachimangu, wondering how it was he had struck at precisely the right moment. Another glimpse of Kagehisa’s character is revealed in what happened next. One day he approached Kannemaki, informing his teacher, “Okay, I’ve learned all you’ve got to teach me.” It’s possible Kagehisa was a bit more diplomatic than that. Formal Japanese is a language that allows one to be indirect and still get across the idea. Given Kagehisa’s personality, it’s a good bet he didn’t use the more formal and gracious modes of speaking and made his point in the plain Japanese of the day, more or less as I’ve translated it. It is an equally good bet that Kannemaki’s response was equally brusque. “Oh yeah? Show me.” And that is how they ended up facing one another, teacher and student, wooden practice weapons in their fists. It did not go well for Kannemaki. Not the first time, when Kagehisa’s bokken deflected his strike and countered, landing lightly but with enough force to make Kagehisa’s point. Nor the second, when Kannemaki demanded a rematch. He lost again. Kagehisa, it seems, had discovered the secret of his success over the assailant back at the temple. I met a direct descendant of Kannemaki’s once, in a dojo in Nagano Prefecture where he practiced iaido. He was somewhat surly and distant, and another member there told me it was because he just didn’t like foreigners. I have always projected that descendant’s personality on Kannemaki Jisai, which is not entirely fair, of course. To his credit, Kannemaki was gracious and honest enough to admit he’d been beaten. He asked Kagehisa how he’d done it. The modern reader, if he knows anything of Japanese swordsmanship, is apt to pause here, noting some strategic discrepancies. Waiting for an attack is almost always a good idea when you can do it. In a one-on-one contest involving swords or most other weapons, the guy who moves first—unless he is very, very good—is likely to lose. There are instances, though, such as facing the threat of multiple opponents, when standing there and waiting for something to happen is not the way to succeed. So we have to be careful about taking Kagehisa’s explanation too literally. It is better to assume he meant that by finding the right opportunity—whether by waiting in a passive sense or “encouraging” the opponent to move first in some way—a contest can be decided at the very last second by a single strike. And that a single strike, correctly understood and implemented, can crystallize a thousand techniques. This “one strike” strategy was the basis for Kagehisa’s swordsmanship. In recognition of its fundamental importance, he gave himself a new name: Ito Ittosai Kagehisa. Kagehisa left Edo, traveling over much of central Japan during the last half of the sixteenth century. He engaged in practice duels with a number of swordsmen and other martial artists, none of whom bested him. It was a period of testing his theory of the “one sword,” or itto. Kagehisa gave instruction to scores of those wishing to train under him. His Itto ryu achieved a prominence in martial arts circles matched by few other styles of swordsmanship in the history of Japan. But in the truest sense of the word, he had only two who could have been considered his students. Excerpted from Clouds in the West © 2004 by Dave Lowry with permission from The Lyons Press, Guilford, CT 06437. Dave Lowry is a writer and historian specializing in Japan and traditional Japanese culture. He has been a student of the modern and classical martial disciplines of Japan since 1968 - including karate, aikido, the bo and kenjitsu. His columns have appeared for years in a variety of martial arts magazines and he is also an accomplished calligrapher. His books include "Sword and Brush - The Spirit of the Martial Arts", "Autumn Lightning: The Education of an American Samurai" and his new book “Clouds in the West” published by The Lyons Press.